A. R. Ammons once said, "A word too much repeated falls out of being", and although the term Big Data sometimes seems to be "too much repeated", it's not about to fall "out of being". That said, it is subject to a lot of hype. The term Big Data is a bit of a misnomer. 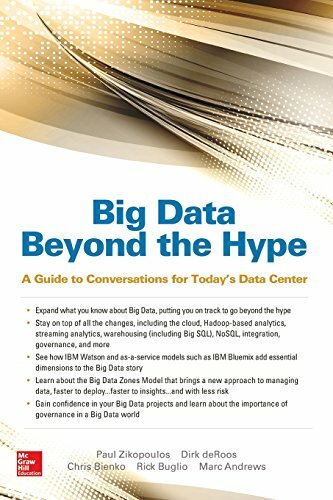 Truth be told, we're not even big fans of the term--despite the fact that it is so prominently displayed on the cover of this book--because it implies that other data is somehow small (it might be) or that this particular type of data is large in size (it can be, but doesn’t have to be). This is Big Data in a nutshell: It is the ability to retain, process, and understand data like never before. It can mean more data than what you are using today; but it can also mean different kinds of data, a venture into the unstructured world where most of today's data resides. The Big Data opportunity. It's a shift, rift, lift, or cliff for your business--this book is going to help you experience the shift and lift, while those that don't work to get beyond the hype end up in a rift or cliff. In this book you will learn how cognitive computing systems, like IBM Watson, fit into the Big Data world. You'll learn how Big Data needs a "ground-to-cloud" architecture, what a Data Refinery looks like, and theimportance of a next generation data platform. Gain an understanding of the concepts of data-in-motion, data-at-rest (technologies like Hadoop play here, as well as others), the role that NoSQL and polyglot play in a leading edge analytics architecture, and more. Get details about the Big Data platform manifesto and why it is a must for any Big Data project. Capturing, storing, refining, transforming, governing, securing, and analyzing data, traditionally or as a service, are important topics alsocovered in this book.